Launch jobs such as the Warrior, Ranger, Mage, White Mage, and Hunter currently have glowing ratings for both solo and multiplayer performance. The reason for this is what’s known as Job Skill Cards. They’re a recent addition to the Japanese version of the game and can wildly boost the stats of a job by giving it various powerful auto-abilities. 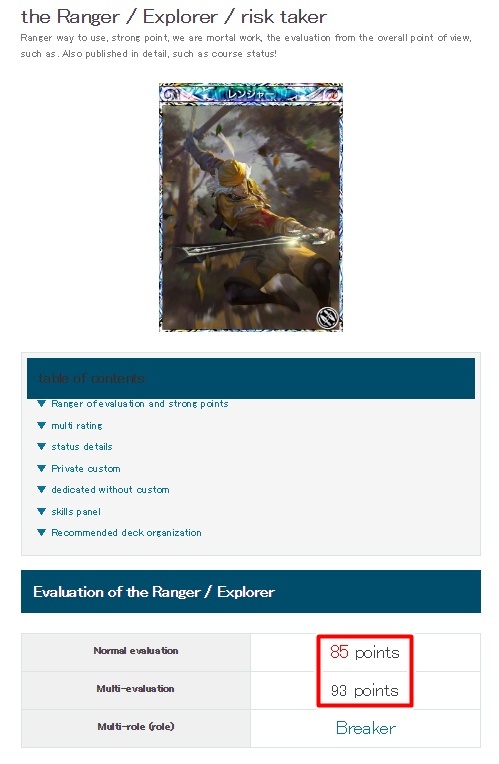 I’m going to use the Ranger as an example to explain why it has a crazy high rating. Lots of love for the Ranger! Japanese players have given this job a very positive 85 points (out of 100) for solo play use and a whopping 93 points for multiplayer. Underneath the appraisal, there’s a section summarizing the strengths, weaknesses, and its worth in multiplayer. I’ve only included a snapshot of the strengths part because it’s the one that matters most. These are the reasons. They DO NOT apply to global versions at this present time. 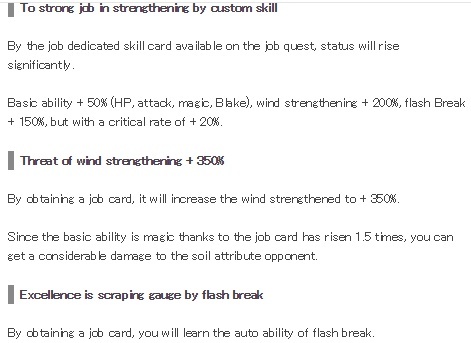 With the job’s exclusive custom skill cards obtained from job quests, the parameters will grow significantly. Basic overall stats, such as HP, Attack, Magic, and Break Power increase by 50%, wind attacks are boosted by 200%, Critical Chance is upped 20%, and a new auto-ability named Flash Break is gained. It adds 150% to Break Power. With the wind strengthening skill card, the total for the auto-ability, Enhance Wind, comes to +350%. Having Flash Break means you can take down a Break gauge extremely fast. As you can see, the differences — most notably for HP and Critical Chance — are immense. I firmly believe that these custom skill cards won’t be added to global versions any time soon so when figuring out a job’s actual worth, always look at its stats without the custom skill modifications. In my opinion, it’s completely fine to keep developing these “early” jobs; especially if you can’t afford or don’t have the Summon Tickets to draw a new job from a Job Card Summon. Just remember that every job has strengths and weaknesses and only having a job means nothing if you don’t know how to use its strengths or give it a deck that brings out its full potential. Basically, don’t worry about all that re-rolling. What you have is probably fine and will get you to where you need to go. i would also add that some of the ratings need a closer look due to how many people actually took the time to rate them.